If you've got 750 horses under your hood, you'll want to keep 'em cool with our 750HP Universal Front Mount Intercooler. 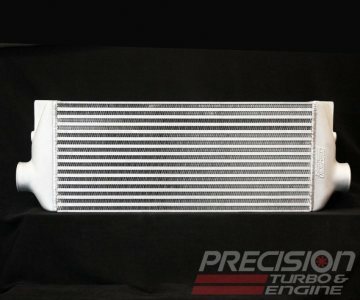 Each unit features a high density core with bar and plate construction which allows the intercooler to better function as a heat sink, and that's a big advantage in stop and go traffic! This design is also much less susceptible to road hazard damage and can handle higher boost levels than comparable tube and fin designs.